Thermoregulation, Part II: From Basic Neuroscience to Clinical Neurology, Volume 155, not only reviews how body temperature regulation changes in neurological diseases, but also how this aspect affects the course and outcomes of each disease. Other sections of the volume review three therapeutic approaches that are aimed at manipulating body temperature, including induced hypothermia, induced hyperthermia and antipyretic therapy. 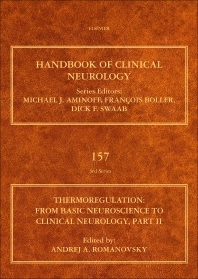 The book is comprised of nine sections across two volumes, five dealing with the basic aspects of body temperature regulation and four dealing with the clinical aspects. Basic sections cover the Thermoregulation system, Thermoreceptors, Thermoeffectors, Neural pathways, and Thermoregulation as a homeostatic function. In addition, the book covers the physiology and neuroanatomy of the thermoregulation system and provides descriptions of how the regulation of body temperature intervenes with other physiological functions (such as sleep, osmoregulation, and immunity), stress, exercise and aging. Basic sections serve as an introduction to the four clinical sections: Body Temperature, Clinical Significance, Abnormal Body Temperature, Thermoregulation in Neurological Disease and Therapeutic Interventions. Andrej A. Romanovsky, MD, PhD, is an integrative physiologist and neuroscientist studying body temperature regulation. Originally from St. Petersburg, Russia, Dr. Romanovsky was granted his MD with Distinction by the Ivan Pavlov Medical University (St. Petersburg) in 1984. He completed his pathophysiology residency in 1986 at the Pavlov Institute of Experimental Medicine of the Russian Academy of Medical Sciences in St. Petersburg. In 1989, he received a PhD in physiology from the Institute of Physiology of the National Academy of Sciences (Minsk, Belarus). Following postdoctoral training at the University of Tennessee Medical School in Memphis (1991–1994), Dr. Romanovsky accepted the position of Associate Scientist and Director of the Thermoregulation Laboratory at the Legacy Health System in Portland, Oregon (1994–2000). Since 1999, he has been working as Professor at St. Joseph’s Hospital and Medical Center in Phoenix, Arizona, where he directs his basic research laboratory (FeverLab). He also holds an Adjunct Professor appointment at the Arizona State University School of Life Sciences in Tempe, Arizona. Dr. Romanovsky has published more than 100 articles in peer-reviewed scientific journals. His research has been funded by the National Institutes of Health, the State of Arizona, and a number of pharmaceutical companies and foundations. He has served on study sections and reviewed grant applications for the National Institutes of Health, the National Science Foundation, the Medical Research Council (UK), the Canadian Institutes of Health Research, the Swedish Research Council, the Dutch Research Council, the National Research Foundation (South Africa), the National Council of Romania, the Polish National Science Center, the government of Hong Kong, and other agencies in many countries. He has served on boards of multiple journals including the American Journal of Physiology (Regulatory, Integrative and Comparative Physiology), Public Library of Science One (Academic Editor), and Acta Physiologica Hungarica (International Board), and is the founding Editor-in-Chief of the journal Temperature. He is a co-founder of Catalina Pharma, Inc.